Ch. Pouch Cove's Goodfellow, "Andrew"
Ch. Pouch Cove's Midnite Bay, "Bayle"
Ch. Amity's Bearfoot Of Pouch Cove, "Bearfoot"
Ch. John's Big Ben of Pouch Cove, "Ben"
Ch. Pouch Cove's Darbydale Booker, "Booker"
Ch. Seabrook's Best Man At Pouch Cove, "Bradley"
Ch. Pouch Cove's Body 'N Soul, "Buddy"
Ch. Pouch Cove's Too Close To Call, "Chad"
Ch. Cypress Bay Pouch Cove Chester, "Chester"
Ch. Sunvalley Petitions Pouch Cove, "Christopher"
Ch. Pouch Cove's Company Man, "Cole"
Ch. Pouch Cove's Affadavit, "Davey"
Ch. Darbydale's Somebody Pouch Cove, "Dawson"
Ch. Pouch Cove's Best Evidence, "Dennis"
Ch. Dalken's Denver of Pouch Cove, "Denver"
Ch. Pouch Cove Now Docks at Nakiska, "Docker"
Ch. 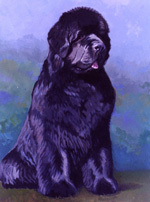 Tuchamore's Dutch of Pouch Cove, "Dutch"
Grand Ch. Pouch Cove's New Deal, "Franklin"
Ch. Pouch Cove's Gabriel's Legacy, "Gabriel"
Ch. Pouch Cove's Goliath, "Goliath"
Ch. Pouch Cove Gref of Newton Ark, "Gref"
Ch. Numa's Had to Be Pouch Cove, "Harrison"
Ch. Highland Bear of Pouch Cove, "Highland Bear"
Ch. Beartrax Hunt for Pouch Cove, "Hunter"
Ch. Pouch Cove's Jacks or Better, "Jack"
Ch. Tempest's Pouch Cove In The Black, "Jackson"
Ch. Pouch Cove's Favorite Son, "Jake"
Ch. Pouch Cove's Peoples Choice, "Jarrod"
Ch. Pouch Cove's Head of State, "Jefferson"
Ch. Pouch Cove's Toad Hall Joe, "Joe"
Ch. Castanewfs Journey 2 Pouch Cove, "Jonathan"
Pouch Cove Raises The Bar, "Jonathan"
Ch. Darbydale's All Rise Pouch Cove, "Josh"
Ch. Pouch Cove's All You Can Be, "JR"
Ch. Pouch Cove's Heads I Win Cayuga, "Kevin"
Ch. Pouch Cove's	Keynote Speaker, "Kevin"
Ch. Skipper's Eminence King of Helluland, "Lincoln"
Ch. Pouch Cove's Call Of The Wild, "London"
Ch. Highland Skye Of Pouch Cove, "Mac"
Ch. Spillway Man of Pouch Cove, "Man"
Ch. Pouch Cove's Matter of Fact, "Matthew"
Ch. Pouch Cove's Vintage Southwind, "Merlot"
Ch. Pouch Cove's Walks Tall Cayuga, "Michael"
Ch. Pouch Cove's All American Amity, "Murphy"
Pouch Cove's Seabrook New Man At Nakiska, "Newman"
Ch. Pouch Cove's Just in Time Nakiska, "Nick"
Ch. Pouch Cove's Peter of Spillway, "Peter"
Ch. Pouch Cove's Repeat After Me, "Peter"
Ch. Pouch Cove's Politician, "Polo"
Ch. Amity's Pipedream of Pouch Cove, "Ralph"
Ch. Brittania's Rico Of Pouch Cove, "Rico"
Ch. Pouch Cove's Joint Venture, "Riggs"
Ch. Pouch Cove's Let It Ride, "Ryder"
Ch. Rocky Reef of Pouch Cove, "Rocky"
Ch. Barharber's Rosco of Pouch Cove, "Rosco"
Ch. Pouch Cove's The Shareholder, "Sawyer"
Ch. Pouch Cove's Dark Horse, "Shane"
Ch. Jubilee You're The Top, "Skip"
Ch. Midnight Lady Especially For You, "Skip, Jr."
Ch. Midnight Lady's My Heart Goes Boom, "Snob"
Ch. Pouch Cove's Spins A Dream, "Spencer"
Ch. Pouch Cove's Statesman, "Tate"
Ch. Pouch Cove's Seafaring Tayle, "Taylor"
Ch. Twillin Gate Quintex, "Tex"
Ch. Pouch Cove's Supreme Justice, "Thomas"
Ch. Pouch Cove's Thunder II, "Thunder"
Ch. Pouch Cove's Special Edition, "Tigger"
Ch. Pouch Cove's Candidate, "Todd"
Ch. Numa's Incumbent At Pouch Cove, "Truman"
Ch. Waldo of Pouch Cove, "Waldo"
Ch. Pouch Cove's For The Record, "Walker"
Ch. Daddy Warbucks of Pouch Cove, "Warbucks"
Ch. Pouch Cove's Onyxbay Wizard, "Webster"
Ch. Mooncusser Reef Of Pouch Cove, "Wimpy"
Ch. Yankee Peddler of Pouch Cove, "Yankee"
Ch. Schooner Yosef of Newton-Ark, "Yosef"